Kraus & Naimer | UK Electrical Distributors – E. Preston (Electrical) Ltd.
Blue Line switchgear, rotary cam switches, contactors, motorstarters, (enclosed) KG switch disconnectors, control stations. 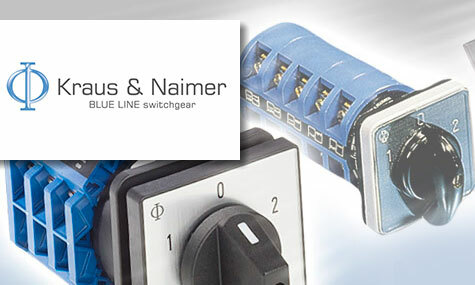 Kraus & Naimer Blue Line Switchgear is the UK division of Kraus & Naimer — a global company with over 100 years of history and 1000 employees, producing around 4.3 million switches every year. Kraus & Naimer supplies an extensive range of switches, including cam operated rotary switches up to 2,400 Amps, isolating main/main emergency switch disconnectors up to 1,250 Amps and changeover switches up to 2,400 Amps — all of which can be supplied for mounting in switch panels or on machines, or enclosed in insulated plastic, GRP, mild steel or stainless steel. Kraus & Naimer are the proud inventors of the world’s smallest cam switch. E. Preston Electrical Ltd is an official distributor for Kraus & Naimer electrical products. Visit the online store to browse thousands of components.